The 737-300 initial operation was in 1981. The airlines that were first to use this aircraft are USAir and Southwest Airlines. It was the first model of the 737 Classic series. It was the first of the 3 member 2nd generation CFM56 power-driven Boeing 737 family, the others were 737-400 and shortened 737-500. This aircraft is a short to medium range airliner. 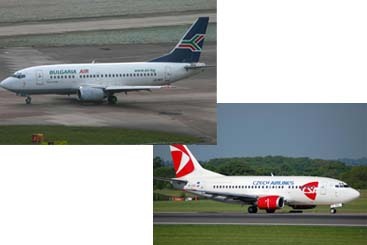 The main modification of the 737-400 over the smaller 300 is the fuselage stretch. To manage the increased weights, more powerful CFM56s are built. Other modifications are slight. The initial operation of the 737-400 was on October of 1988. Its counterpart is the similar size Airbus A320, which has greater levels of technology, longer range and has greater speed but is heavier. The 737-500 initial operation was in 1900. The first airline to operate it was Southwest Airlines. Its fuselage length is the same with the 737-200 at the same time incorporating the enhancements of the Boeing 737 Classic series. It featured a modern and direct substitution of the 737-200, at the same time allowing longer routes but fewer passengers to make it more economical with that of 737-300. There are a lot of Russian airlines which uses this aircraft, these includes Aeroflot-Nord, [Rossiya Airlines]], S7 Airlines, Sky Express, Transaero, and Yamal Airlines. All of these airlines are getting 2nd hand models of the -500 .